Moose-Gyp fire #1 Moose-Gyp fire around noon today. The following photos were taken progressively through the afternoon until around 3:00 PM. Photo courtesy Judy Anderson. Moose-Gyp Fire #2 Moose-Gyp fire between noon and 3:00 PM today. Photo courtesy Judy Anderson. Moose-Gyp fire #3 Moose-Gyp fire between noon and 3:00 PM today. Photo courtesy Judy Anderson. Photos by Pam McCulloch, Judy Anderson and Andrew Garland. Wednesday, 4:30 PM Update: A wildfire started in the Salt Lick Mountain area of the Upper Green around noon today and is putting out a large column of visible smoke. The fire is in the area of the Moose-Gypsum Road. 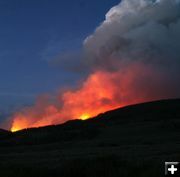 It is northeast of residents of the Upper Green in the general vicinity of The Place, and west of Green River Lakes Campground and Square Top Mountain. We don’t have any official information yet, so this report is preliminary and subject to change as more information comes in. Unofficially we can say the fire was reported around noon and has seen active fire behavior with torching trees and a large column of smoke. Firefighters from the Forest Service and county volunteer fire departments quickly responded to the scene. A Forest Service helicopter has scouted the blaze. Initial unofficial reports put size around 10-75 acres at of the time of this report. Firefighters attempted to gain access via the Jim Creek Road, but residents reported they came out and went in via the Moose-Gyp road. Residents have reported seeing flames shooting high in the air as trees torch. It is uncertain whether or not the fire is in the wilderness boundary. Red Cliff Bible Camp, located in the area, is aware of the fire and in communication with firefighters on the scene to see how the fire might impact their camp. We have unconfirmed reports they were preparing for, or are in the process of, evacuation. We will post updated information as it comes available. Bob Rule with Pinedale KPIN 101.1 FM radio is also broadcasting updates as they come available. He will put recorded updates tagged with the weather and will do live updates if there is breaking news on the status of this fire. Fire danger remains Extreme on the Bridger-Teton National Forest at this time. Stage I fire restrictions are in effect limiting campfires to developed campgrounds only. Moose-Gyp fire #5 Moose-Gypsum fire around 3:00 PM Wednesday, July 11. Photo by Judy Anderson. Moose-Gyp #4 Moose-Gypsum fire around 3:00 PM on Wednesday. Photo by Judy Anderson. Red Cliff Bible Camp View of approaching fire from Red Cliff Bible Camp on Wednesday afternoon. Photo by Andrew Garland. Salt Lick Fire plume View of Salt Lick fire on Wednesday afternoon, as seen from Red Cliff Bible Camp. Photo courtesy Andrew Garland. Red Cliff Bible Camp View View from Red Cliff Bible Camp. Photo by Andrew Garland. View from Red Cliff Bible Camp View from Red Cliff Bible Camp. Photo by Andrew Garland. Red Cliff View View from Red Cliff Bible Camp, located up Moose-Gypsum Road. Photo by Andrew Garland. View from Cora Y View of fire from the Cora turnoff onto Hwy 352 from Hwy 191 on Wednesday evening. Photo by Pam McCulloch. View from The Place View of fire from The Place/Green River Guest Ranch on Wednesday evening. Fire fighters staged out of The Place to coordinate evacuation efforts. Photo by Pam McCulloch. View from Moose-Gyp road View of fire from the junction of the Moose-Gypsum road and Hwy 352 on Wednesday evening. Photo by Pam McCulloch. Salt Lick fire at night View of Salt Lick fire as night falls on Wednesday, July 11. Photo by Pam McCulloch.